The Demag brand has been around since it began in 1819 but it was around 1840 when the manufacturing of overhead cranes began. 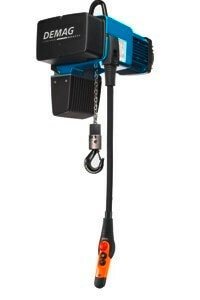 This crane company has evolved over its many years and since the early 1900’s has been manufacturing its world renowned electric hoists. Demag has manufacturing bases across the globe, in no less than 5 continents, reaching over 60 countries with its products. Demag products serve many different types of industry including; construction, aircraft building, automotive, mining, ship building, energy plants, steel industry and many more. 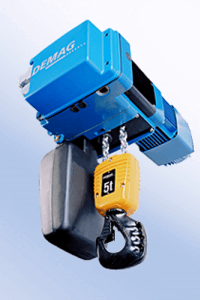 Demag electric hoists offer great reliability and efficiency whilst giving maximum performance. Demag is now part of the Terex corporation, a global manufacturer of lifting equipment and material handling solutions. Terex are probably best known for their heavy construction equipment and have only been involved in smaller, compact lifting and handling equipment since 2000, and acquired Demag mobile cranes in 2002, it wasn’t until 2012 that the Demag brand fully became part of the Terex group and branded as Demag by Terex.